More than 70 people from nine countries recently gathered at Avondale College (NSW) for the Adventist Church in the South Pacific’s (SPD) Executive Committee meetings. Held November 14-15, 2018 the year-end meetings featured reports from each of the unions and institutions across the Pacific, with a focus on mission, discipleship, and respectful discussion. Delegates, representing the four unions, many conferences and missions, as well as a number of lay people, heard many reports detailing the highlights and challenges facing the Church in the region. However, much of the discussion centered on women in ministry and the compliance statement passed down from the General Conference (GC) at its recent Annual Council. As an extension of the GC in this region — the meetings were attended by three GC representatives — the SPD is obliged to pass on GC decisions. This was done, although with some concern expressed in the voted actions, highlighting the implications policy and word changes would have. One implication explored at length was the increased risk of liability and litigation at all levels of the world Church if key constitutional structure policy is changed. In light of this the delegates passed a resolution to ask the GC for exemptions. Visiting GC treasurer Juan Prestol said other countries such as Canada, Germany, and England faced similar issues. The SPD’s Discipleship Ministries Team (DMT) reported a keen interest in the past 12 months among church members for disciple-making resources, especially books printed by Signs Publishing: 5,000 copies of Mission Shift, 16,000 copies of Following Jesus, 7,000 copies of Following the Spirit and 10,000 copies of If You Can Eat, You Can Make Disciples have been ordered. On top of that, 3,000 orders have already been received for the French translation of Following Jesus, which has only just been launched. The DMT team also launched The Tuis, an animated children’s DVD series that takes families through the 28 Fundamentals. Delegates also emphasized a desire to send more youth delegates to the GC Session in 2020. After each entity delivered its report, one of the delegates would pray for them. On day one, following an inspiring worship by SPD president Pastor Glenn Townend, the delegates split into their individual union groups to discuss challenges and goals for their region of the South Pacific. In the Trans Pacific, challenges identified included the need to focus on member retention and communicating at a local church level. Within Australia, delegates asked whether the quantitative statistics provided gave a qualitative strategy for moving forward. Their recommendation was to identify one key strategic focus area. New Zealand’s group looked at what was really working within their Union, what was not and what they could do about it, suggesting a mini SWOT analysis to narrow down a key focus area. Similarly, the group from the South Pacific, which included Division staff and those from SPD-owned institutions, looked at how they could use the data provided to utilize their resources and reach strategic goals. In Papua New Guinea, a key challenge identified was communication, especially due to the country’s vast geographical area. Delegates from the group spoke about the challenge to complete reports in a timely fashion, also noting literacy in rural areas was an issue. Their goal was to introduce electronic data collection to reduce the time in providing reports. On the morning of the second day, delegates spent time considering some difficult situations that might come up in today’s politicized climate under the heading “Adventist Ethos Challenges,” while SPD communication director Dr. Stephen Currow presented on some of the religious liberty issues the Church is facing. Sanitarium’s report highlighted growth of certain products and markets around the world, including specific research they were undertaking in groundbreaking areas. Pacific Adventist University and Avondale College both reported good spiritual outcomes for their students, while PAU has finished some new building projects and solidified their relationship with Atoifi nursing school. Adventist Media CEO Brad Kemp reported that more than 2,000 people had participated in courses from the Adventist Media Hope Discovery Centre in Wahroonga, and more than 2,000 people from the New Zealand Hope Bible School during the past 12 months. The Discovery Centre is also receiving between 200 and 300 prayer requests a week. A highlight of the Sydney Adventist Hospital report was that the San’s Spiritual Care team visited almost 22,000 patients this year compared to 14,500 last year. CEO Brett Goods says it’s about an “intentional shift” in not only caring for the physical but also spiritual wellbeing of patients. The delegates voted to asked the GC to consider changing its 2020-2025 strategic focus of “I will Go” to “We will Go,” saying that overall, the plan reflected what the SPD is focusing on but that the word “we” better reflected the Church working together to reach the world. 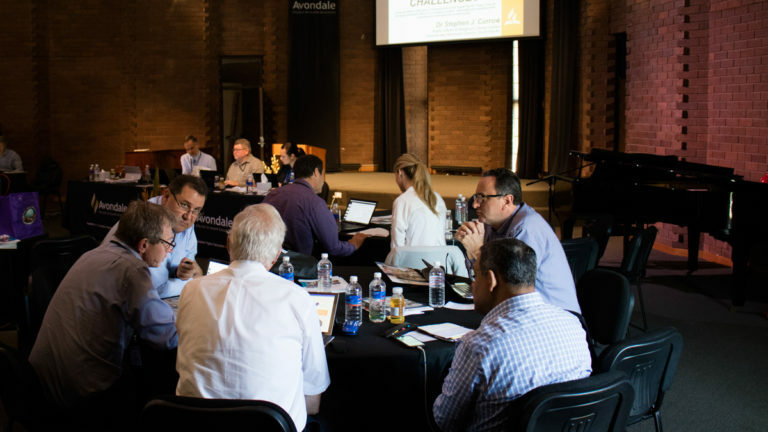 Dr. Ella Simmons, GC vice president, who attended the meetings, was impressed by the professionalism and the desire to help the Church worldwide move through some difficult issues. She remarked that all of the delegates were well prepared and business moved smoothly. This article was written by Jarrod Stackelroth and Maritza Brunt, and was originally published by Adventist Record. It is reprinted here with permission. Image: Participants discussing some of the issues around their tables. Courtesy of Adventist Record.